We are back to earth from the space moshling shenanigans from Pizmo on day 13 with the rather fuddy-duddy and adorably fungi to be with (see what we did there – sorry), Fusty; the fabled fungis. 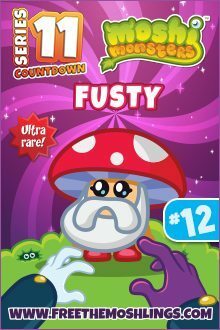 These older, ultra rare, moshlings may look as though they couldn’t rave their way out of a mushroom paper bag, but you would be wrong, they are well known for having the young groove in their heart, and can keep on boogie-ing until dawn long after many younger moshlings have called it a day. Their dodgy knees haven’t stopped them from having a few great stories to tell about Moshistock, particularly the one where Screech McPieHole collapsed on stage. Why not ask them about it next time you seeing one grooving along. Habitat: If you are looking for Fusty, then Moshi music festivals are the best place to find them chilling out, but they are really from the Friendly Tree Woods. Likes: Glamping, don’t we all, and backstage passes so they can really get to see their musical heroes close up and groove on down with them all in their dressing rooms. Dislikes: Never give them a toasted toadstool – that is really not on, and they don’t like squares either, but I suppose that is because they are rather into mushroom rings…right? So that was today’s fungi, Fusty the OAP boogie moshling, what will the moshling madness give us tomorrow I wonder?